in Creative & Tech with tags B2B Marketing, Canon, Canon Printers, Orchestra Both comments and trackbacks are closed. The phrase “work of art” typically doesn’t conjure up images of office electronics, working together in perfect harmony. But as the latest spot from Canon illustrates, this isn’t your typical printer. To demonstrate the efficiency and reliability of their imageCLASS printers, Canon asked a 19-person orchestra to perform a special arrangement of Beethoven’s 7th Symphony, but instead of reading sheet music on a stand, they were surprised with 19 imageCLASS printers that would print the sheet music on stage, in real time, before each musician. The live performance was not rehearsed and it was first time the musicians and conductor had ever performed together in this ensemble. A single mistake would throw the entire piece off course. The film, created in partnership with 360i, represents a new overall approach to B2B marketing, moving beyond the standard list of specs and costs. This was an opportunity to merge art with business and tech to enhance and even beautify the perception of everyday office occurrences, like printing paper or making copies. 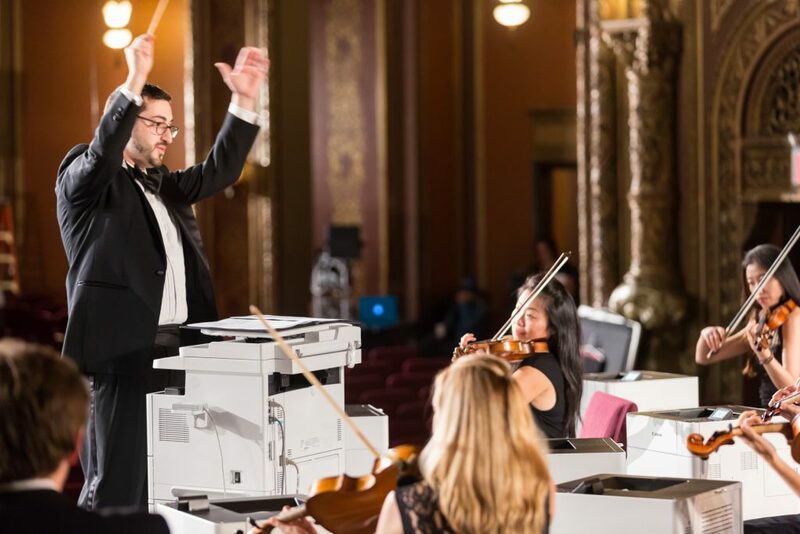 To pull it off, the printers had to print a combined 70 pages over the course of the 90-second arrangement, in complete synchronization in front of a live audience at the iconic United Palace Theater in New York City. This feat required absolute precision timing and utter dependability from the printers in a high stakes environment. The resulting performance was executed in perfect synchronization, without missing a single beat. Canon’s ‘Printers in Concert’ is the first execution in their new campaign and branding initiative, “A Different Class of Printers: imageCLASS” that strives to elevate the brand in the competitive office-equipment market.